If you have an outdoor patio or a balcony in your home or office, you would know how hard it actually is to maintain the furnishing and furniture on them. Brand new furnishings feel washed up and worn just a few months in after being subjected to Singapore’s temperamental and unforgiving weather. But the good news is that all that that can be easily prevented with the use of Roller blinds that can be used for outdoor purposes as well! What is Outdoor Roller Shades? Functionally, Outdoor Roller Shades work the same as indoor Roller shades with the use of either a manual spring chain system or a motorised automatic system. However, that’s about where the similarity ends. Outdoor Roller Shades are specialised outdoor coverings that can be installed in balconies or patios to protect outdoor furnishing from rain and harsh elements. These high quality fabrics come with durable steel tubes and make use of heavy duty materials that is meant to withstand anything the local climate can throw at them. 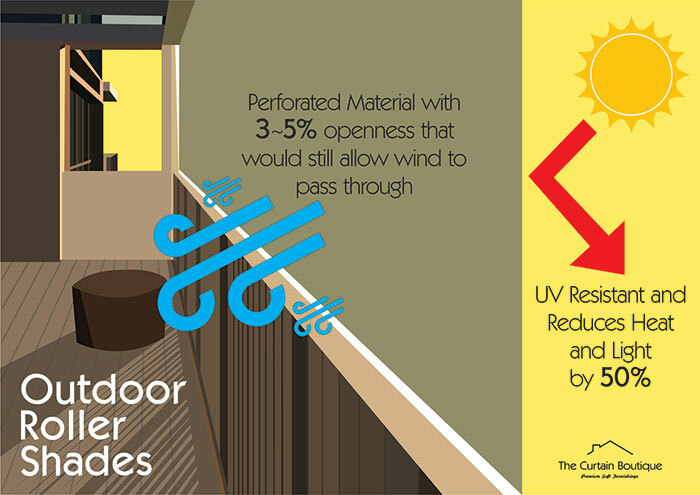 What are the benefits of using Outdoor Roller Shades? Outdoor Roller Shades has been getting increasingly popular over the past few years and for good reason. Aside from being able to block out rain and prevent them from ruining your furniture, Outdoor Roller Shades are also UV resistant and have been tested to be able to block out light and reduce heat by approximately 50%. Bid goodbye to expensive Air Con bills as on top of blocking out heat, Outdoor Roller Shades are also made with a perforated material of a bit 3-5% of openness. This means that while it is able to block water droplets of rain, it would still allow wind and limited sunlight to pass through. 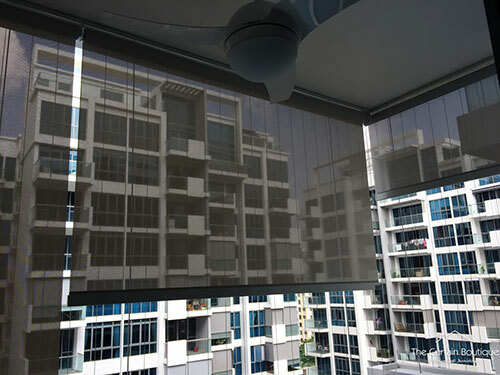 Against strong winds that do occasionally hit Singapore Shores, The Curtain Boutique’s Outdoor Roller Shades also come with Wind Guide Cables that back the Rollers Shades and prevent it from flapping around even during torrential weather. Why you should install Outdoor Roller Shades? For starters, Outdoor Roller Shades help you save on electricity bills over the long run as it helps to reduce your home temperature. Over time, the cost of installing Outdoor Roller Shades would be minimal as compared to the savings from investing in indoor cooling systems. The ability to block out light as well would also mean that you would be able to block out the annoying glare and watch your TV in peace even on sunny days. 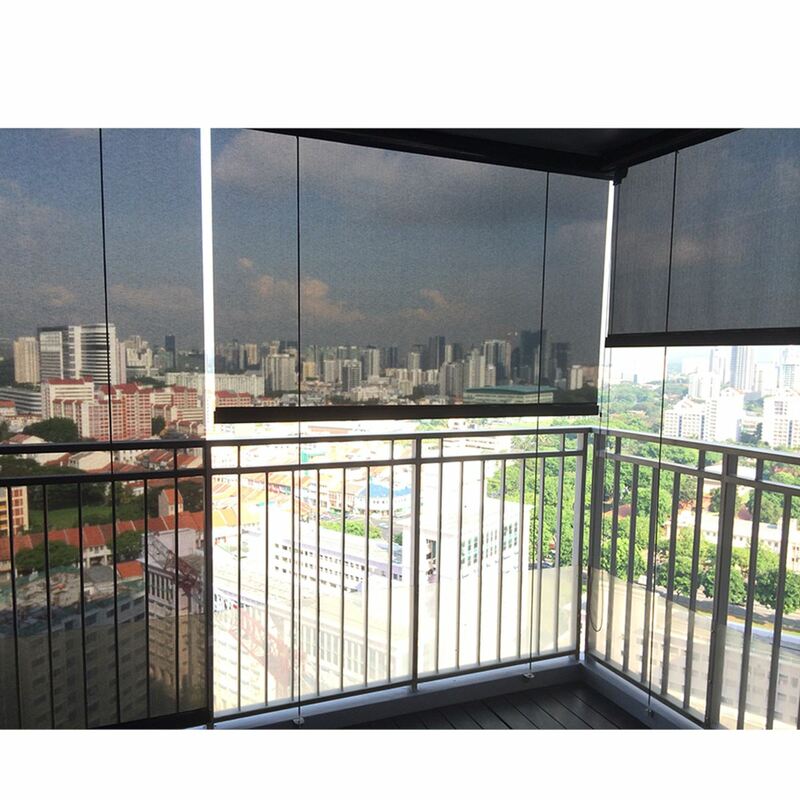 Removing/reducing the exposure of natural elements such as rain, wind, heat, sun etc also helps in prolonging the life of your furnitures that in Singapore terms, can easily cost an arm or a leg. Are Outdoor Roller Shades durable? 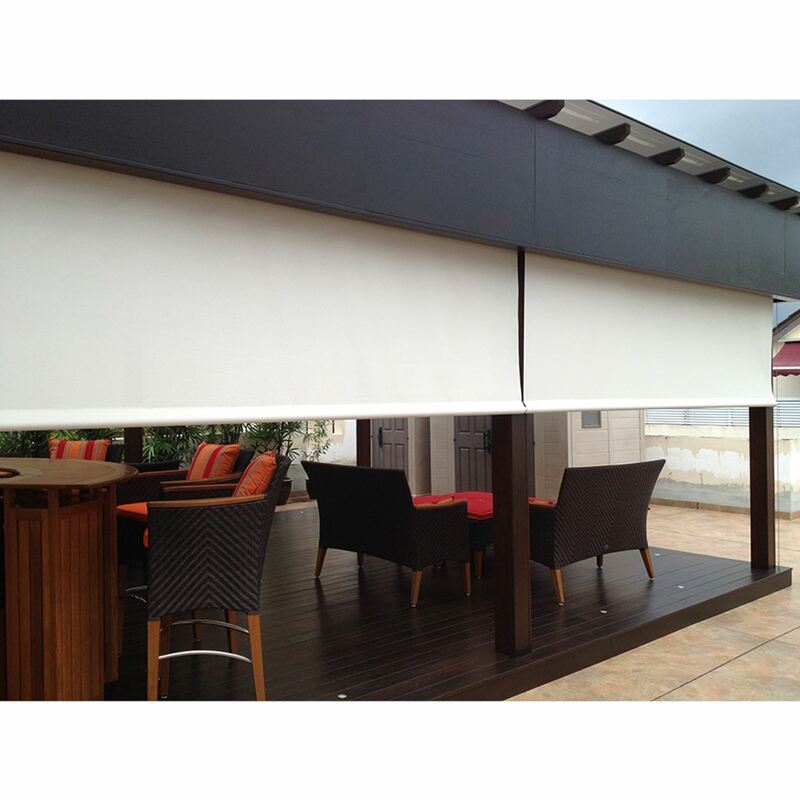 Outdoor Roller Shades on it’s own is made to last and require simple maintenance. The materials are made of heavy duty systems that would have no issue with handling local climate. Outdoor Roller Shades do not require frequent cleaning and only the occasional mild soap and water combination would be able to wash away the dust particles caused by rain and natural elements. 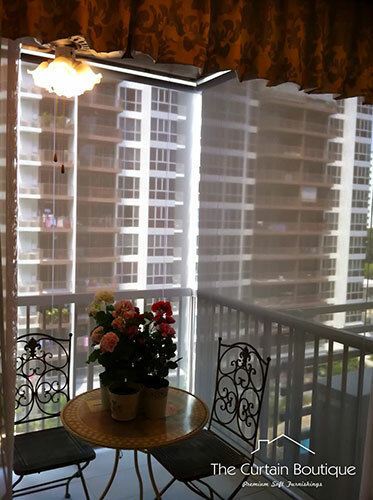 I live in a Condominium, can I still install outdoor roller shades? One of the most common questions we do get about installing outdoor roller shades is whether they can be used for Condominium Balconies. The short answer is Yes it can be done! 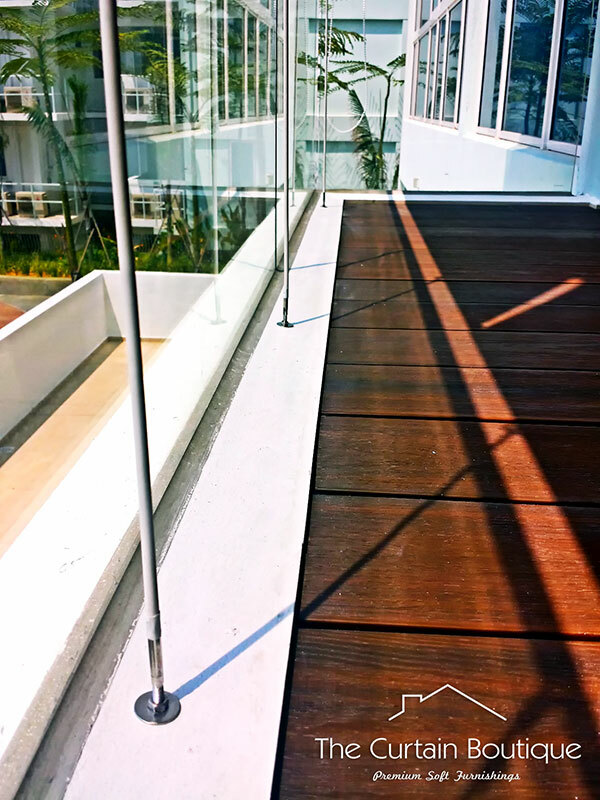 However, as Outdoor Roller Shades do affect the exterior facade of the building, it is subjected to the approval of your condominium’s management office. On a general basis, most condominiums do allow the installation of outdoor roller shades as long as they adhere to the pre-approved colour schemes. 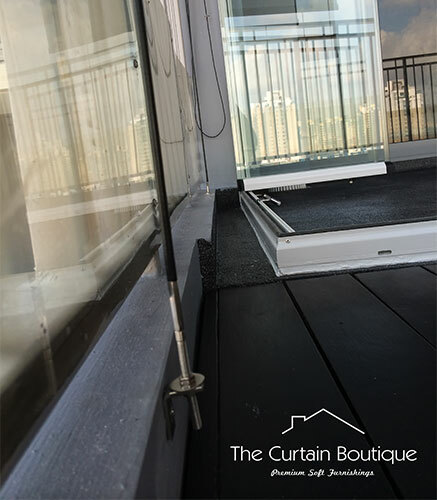 The Curtain Boutique work hard with residents to fight for and gain the approval of Outdoor Roller Shades in the condominiums we work with. I wish to install Outdoor Roller Shades, how do I go about doing it? 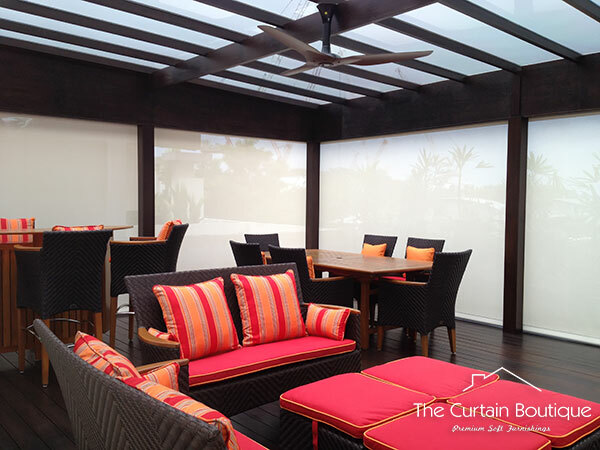 The Curtain Boutique is an award winning Singapore Curtains & Blinds supplier that provides both indoor and outdoor roller shades. 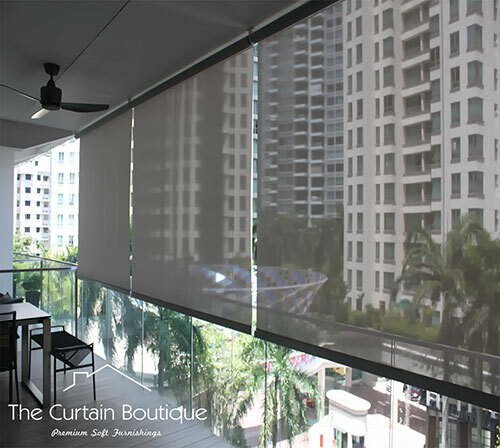 Get in touch with us today at enquiry@tcb.com.sg or speak to any of our Curtain Specialist through our online chat to find out more about our Outdoor Roller Blinds and/or ask for a FREE onsite measurement and quotations.